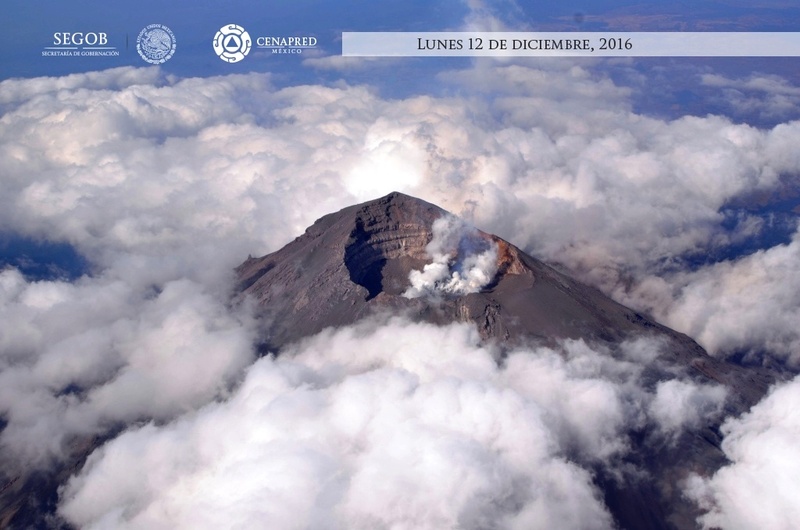 The last flyby at Popocatepetl Volcano was on 12 December, 2016. 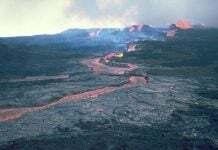 Scientists observed the inner crater was almost completely filled with lava. 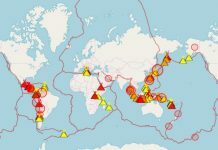 In other words, about 3 million cubic meters of lava are likely going to blow in the air by one or more explosions in the coming days or weeks. 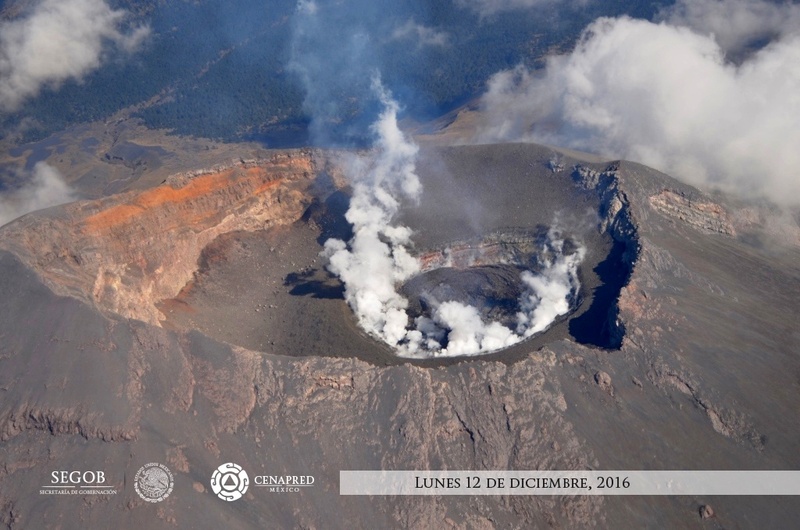 On December 12 was held with the support of the federal police, one of the Popocatepetl volcano reconnaissance overflights. He had favorable weather conditions to make relevant comments. From observations made during this flight, it was observed that the dome 71, which began to be set up on 29 and 30 November, almost completely filled the inner crater, reaching a diameter of 280 m and a thickness of at least 50 m.
The main crater of the Popocatepetl volcano is filled with more than 3 million cubic meters of lava and ready to blow. The depth of the inner crater floor relative to the main crater was reduced to approximately 15-20 m. The volume of the dome was estimated at about 3 million cubic meters. 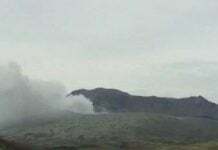 It is likely that in the coming days or weeks, this dome will be destroyed by one or more explosions similar to those presented in February and March 2015, so that CENAPRED exhorts not to approach the volcano and especially the crater. The volcanic alert semaphore of the Popocatepetl volcano remains in Amarillo Phase 2. 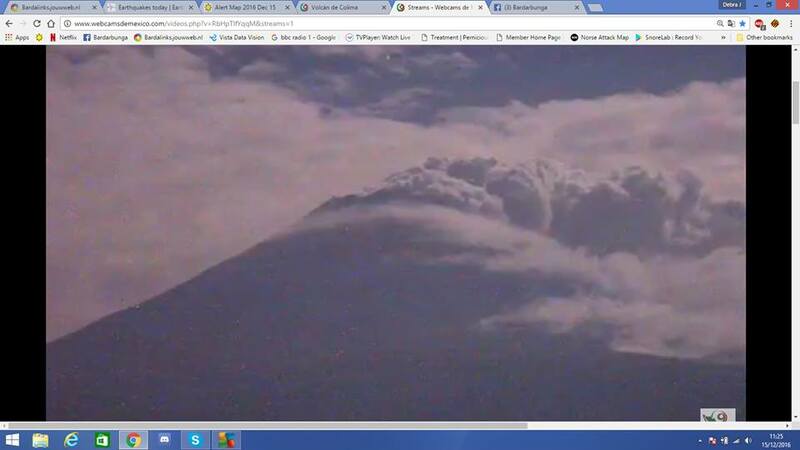 In the last 24 hours, through the seismic records of the Popocatepetl volcano monitoring system, 66 exhalations of low intensity accompanied by steam and gas, as well as two small explosions today at 1h28 and 4h33 were recorded . In addition, a volcano – tectonic event recorded yesterday at 19:47, with a magnitude of M = 1.5 was identified. Meanwhile, massive amounts of smoke/gas emmitting from Popo continuously for the last 12 hours or so. Is the Popocateptl volcano going to wake up soon? Its main crater is full of glowing lava. When is the volcano going to explode? That’s now the BIG question!